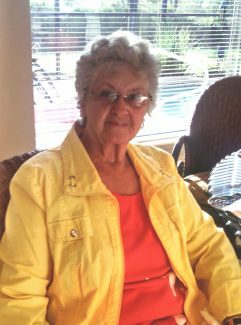 Charleen Ruel Edelman age 87, of Mullen, Neb., passed away on April 2, 2019, from battling cancer. Charleen was born on Oct. 14, 1931, to Charles and Leta Butler in their home in Mullen, Neb. Charleen grew up in Mullen. Charleen married Stan Hampton and had four children, Linda, Richard, John, Earleen, and later divorced. In 1954, Charleen married Marvon D. Edelman from Seneca, Neb., and raised her four children and they had five children together, Eula, Kim, Calleen, Von and Kelly. For three years she lived in Grand Island and worked at the Silas Mason Ammunition Plant where they produced rocket casings for the Korean War. Charleen started working at the Mullen Nursing Home and Hospital in laundry and in the kitchen in 1965. She took classes to become the dietary manager at the nursing home where she worked for 44 years and then retired at age 76. She enjoyed making the elderly happy providing family style cooking. She was involved in the beginning of nursing homes Meals on Wheels Service that has been ongoing for over 30 years. Charleen was involved with the Hospital Auxiliary and has been a member of the Methodist Church for 76 years. At the top of her list of accomplishments that she is most proud of is getting all nine of her children raised and through high school. Charleen has 20 grandchildren, 36 great-grandchildren, and 1 great-great-grandchild. Charleen loved her genealogy and reading. Charleen was so thankful for her special neighbors George and Rosemary Tracy. Charleen leaves behind her children Dan and Linda Miyagi of Wakefield, Neb., John and Terria Hampton of Arthur, Neb., Earleen and Steve Printz of Cheyenne, Wyo., Eula and Charles Younkin of Rushville, Neb., Kim Minor and friend Jeff Erquiaga of Rushville, Neb., Calleen and Glenn Andrews of Gordon, Neb., Von and Tom Roseberry of Cheyenne, Wyo., Kelly and Dean McCaffery of North Platte, Neb., her sister Mrytle Smith of Oneida, N.Y., brother-in-law Don Whipple of Wampsville, N.Y., all her beloved grandchildren, great-grandchildren, nieces and nephews. Charleen was very much loved and will be sorely missed by her family and many friends. Mom your legacy and love will live on in the hearts of all of us. A memorial service was held on April 13, 2019, at the United Methodist Church in Mullen with Pastor Insung Kim officiating. Memorials are suggested to United Methodist Church of Mullen or the Pioneer Memorial Rest Home. Mullen Funeral Home is in charge of arrangements. Online condolences can be left at http://www.govierbrothers.com.